I took a painting and drawing class this term. For three hours every Friday morning, I created rather poor imitations of famous artists’ works. Often the artists our professor chose were artists with a strong French connection, one of whom was Vincent Van Gogh. We spent a lazy Saturday following in his crazy footsteps throughout the nearby towns of Arles and St. Remy. Cafe Terrace At Night, oil on canvas, Sept. 1888 by Vincent Van Gogh. Not quite the same as in the painting. But that’s what artistic license is for, right? In Arles, France. …and the hospital where Van Gogh stayed after he gifted his ear. 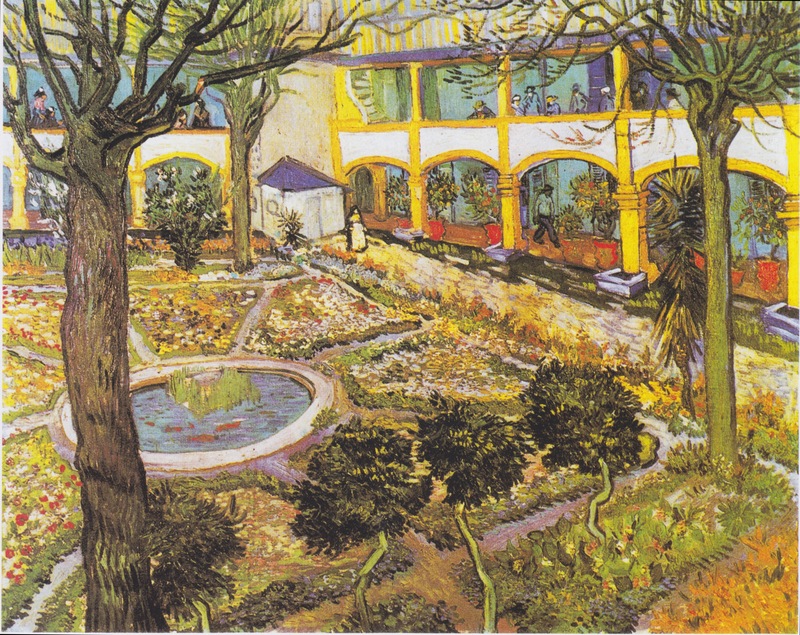 Garden of the Hospital in Arles, oil on canvas, April 1889, by Vincent Van Gogh. Van Gogh had a nice long stay here while he recovered, until the Arlesians petitioned for him to be evicted from town. He went to St. Remy and lived in an asylum there after the petition circulated. We also visited Les Alyscamps, a UNESCO World Heritage Site, which is an ancient Roman necropolis (essentially a cemetery). The church there, called the church of Saint Honoratus, was both gorgeous and hauntingly empty. Stained glass in the church of Saint Honoratus. Another wonderfully Roman attraction in Arles is the Roman Amphitheatre, built in 90 AD for chariot races and spectacles of hand-to-hand combat. Lastly, we had a great time exploring Arles’ Saturday market and eating ice cream in St. Remy (the asylum we wanted to visit in St. Remy was unfortunately closed, so ice cream was in order). Overall, a lovely day was spent in good company and in a beautiful place. Typically French: a simple flower shop, a man with his motorcycle helmet, cobblestone streets. Abundant bowls of spices at the open-air market. Take waffle cookie. Add marshmallow goo with squirt of deliciousness, like a real cherry or a pool of rum. Dunk in chocolate. Eat in mass quantities. Bright flowers on a gray day in Arles. Trying to get Emma to smile. 16 Apr	This entry was published on April 16, 2014 at 9:43 AM. It’s filed under A Weekend In..., France, Travel and tagged Arles, Vincent Van Gogh. Bookmark the permalink. Follow any comments here with the RSS feed for this post. Older: A Week in Barcelona.